Carmen Flescher watches state wildlife officials evaluate the 524 pound bear she helped hunt on private land in Collier County this Saturday. 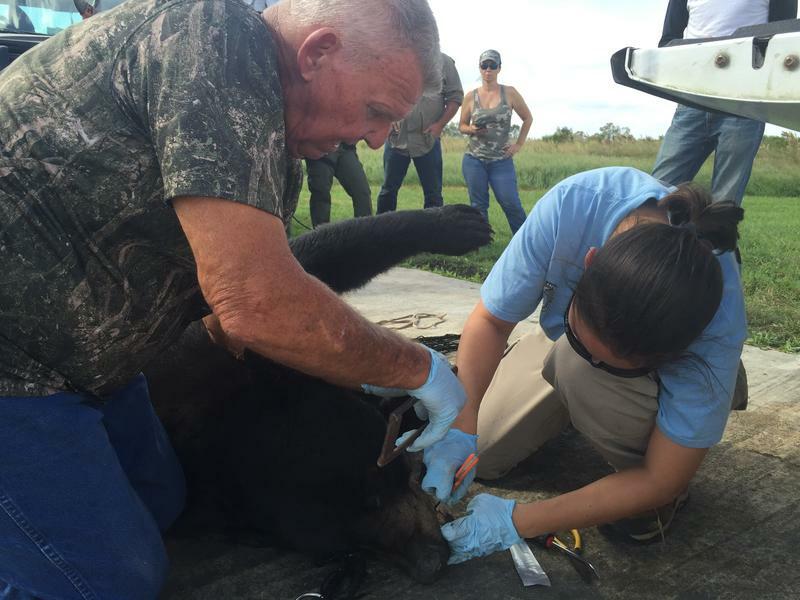 UPDATE: The Florida Fish and Wildlife Conservation Commission says the final count for the hunt was 298 bears. Florida ended its first black bear hunt in more than two decades this weekend. State wildlife officials said the goal was to control a bear population that has been rebounding after more than 40 years of conservation efforts. But, it was a controversial hunt. Animal advocates said recent human-bear conflicts could be reduced in other ways, and the state’s bear population count was dated. Out of an estimated population of roughly 3,500, the state wanted hunters to harvest 320 bears. As of Sunday night, 295 bears were killed. WGCU’s Jessica Meszaros and Topher Forhecz visited a check station in Hendry County on the first day of the hunt. Wildlife officials evaluated killed bears there. Animal advocates were there, too, to make sure hunters followed the rules. This piece features the voices of advocate Anthony Rogers-Wright and hunter Carmen Flescher… in their own words.